-The blogosphere is doubling in size every 6 months. -It is now over 60 times bigger than it was 3 years ago. -As of April 2006, over 75,000 blogs were created daily. -On average, a new weblog is created every second of every day. -19.4 million bloggers (55%) are still posting 3 months after their blogs are created. 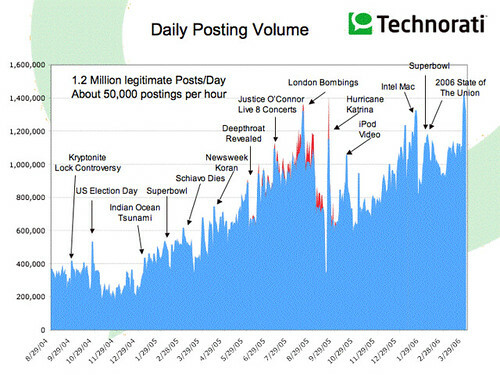 -The blogosphere, and its posting volume, also reacts to world events. Some Rights Reserved © 2004-2006, iblogg.blogspot.com. Via Creative Commons License.